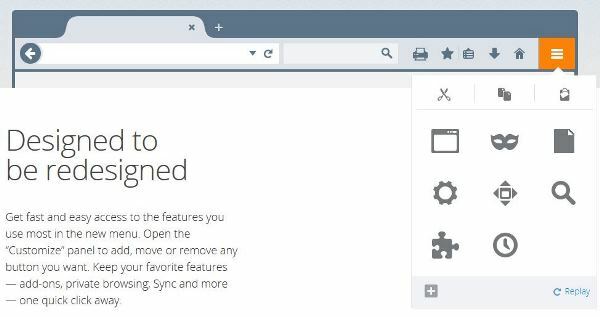 Mozilla Firefox 29 More Customizable Than Ever: Firefox 29 is now available for all platforms, this new version of the browser Mozilla introduces some changes in operation and larger design that have been made in a while . Complying with the new rapid Firefox releases that occur in a chronological space of 6 weeks between the Nightly , Aurora and Beta versions ; finally the browser version of this great new design and accounts to use Mozilla Firefox Sync , comes to stable on all platforms. This new development cycle promises to provide users with new features, performance improvements and stability as well as security updates , rests on 4 different channels that begin in the “night ” or nightly versions , and end with the stable version Firefox . The design greatly improves the tabs is easy to see which tab you are currently visiting as other tabs disappear into the background so it does not pose a distraction when you’re not using . The Firefox menu has moved to the right of the toolbar and puts all the browser controls in one place . The menu includes a tool “Custom” that turns Firefox into a mode where powerful Customization can add or move any function , service or complement. You can now Download the new Firefox for Windows , Linux and Mac OS X.
Mozilla Firefox 29 For Android: The mobile version of Firefox is also updated with new home screen , and the integration with Firefox Sync accounts , you access to all tabs , history and passwords stored in the desktop browser directly from your smartphone or tablet. Firefox for Android also emphasizes personalization and can customize the history , favorites , bookmarks, and the menu on the Reading List page of the home screen and choose the one that appears as the default . Your home screen page appears automatically selected when opening a new tab or a new browser session starts so you can reach your favorite sites faster. You can also hide the pages that do not use regularly or hide them all for a completely new experience of clean tab. Another good version for Android thing , is that it creates two shortcuts in the menu to share , and placed the two applications you use most for you to send pages from Firefox , which saves a few taps if at least want to add sites to Pocket or Twitter , to name a few . 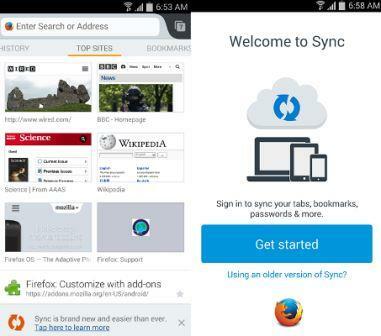 Firefox for Android is available in the Google Play Store.